Wildlife, life that is wild, in Spanish ‘vida silvestre’, is something Argentina has in abundance. Take the ‘perros de la calle’ (dogs of the street), although not quite feral they are far from their domesticated cousins where I’m from — and definitely more streetwise. O ur trip started in Buenos Aires roughly three and a half weeks ago. A grand colonial city booming with students and a European style (its design is influenced by Paris). Running parallel to this are the favelas, which we quite strikingly saw on the outskirts of the city when leaving on a bus heading west. The contrasting lifestyles follows suit for the cities also booming canine community. Our first few nights we stayed in San Telmo, a neighborhood of Buenos Aires. Here and in the surrounding areas we found the dog walkers. Peering over our balcony as our first evening descended we spotted not one not two but eight not so small dogs, all connected through a network of taut leads to the waist of one strained albeit strong man. Day to day these sightings became frequent, and the unmerciful determination of the dogs against the silent resilience of the walker was always entertaining to see. In stark contrast the ‘perros de la calle’ parade their own corner. Sometimes in two’s but quite often alone guarding their patch with ferocity, working to keep their pride in tact and their street credibility secure. This ferocity, in the streets of cities and towns in the month or so we’ve been here, I’ve only once seen extend towards humans. Here both humans and street dogs successfully ignore one another, no unnecessary attention is given from one to the other (asides from animal loving tourists). Dogs that have an owner and a home however adopt a primary role – guard dog. No matter how small, they will bark through the gate, door, fence at whoever walks passed. 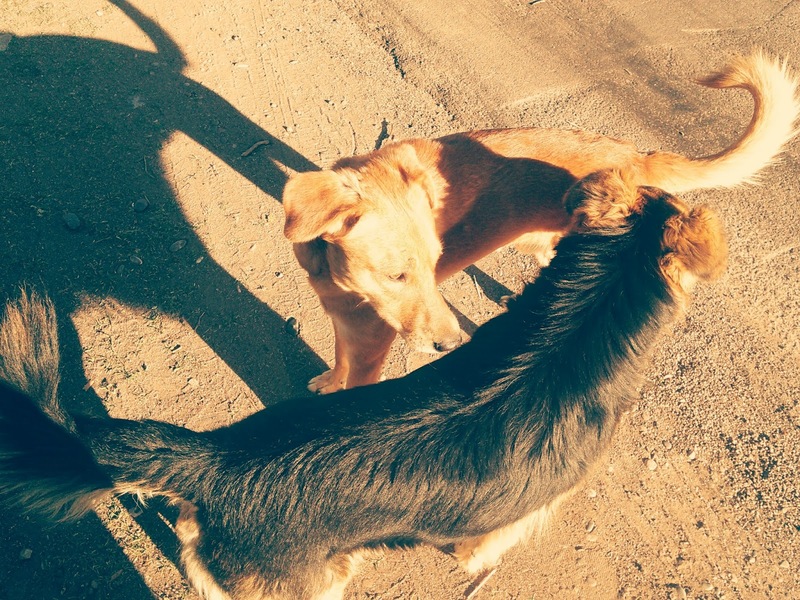 In San Rafael walking along an expansive, dusty, quintessentially Argentine road we fell victim to such guard dogs. One adult German Shepherd and two Rottweiler’s descended, encircled and snarled ferociously. However we were just inconveniencing this canine social custom as dodging between our legs was the true victim, our very own adoptive guard dog! Petit, the loyal city turned country guardian from the nearby farm we’d been staying at. We left unscathed. The next day we found Petit being dragged by the throat across the ground by the neighbor’s dog, which (surprisingly) soon ran off when threatened with a scream. The delicate balance between guard dog and doting companion soon became clear when after a lavishing of attention to Petit I in return got a bite to the face before I could react (this being that one time *). No blood drawn with no intention to cause pain, the warning had worked, I now knew my boundary. As did the little girl who lived on the farm, who bared a small scar on her cheek as a reminder. Which, after the shock wore off, got me thinking about this strange coexistence. Dogs are one of the best adapted species to human existence. First they hunted with humans, then they herded livestock and now for a lot of the world just their company is enough. Their ability to adapt to the expansion of human civilisation was survival instinct, a necessity, look what happened to their relative the wolf, hunted to near extinction in Europe and North America. I wondered whether along the way had something integral to their happiness been lost. Things necessary for all species to be happy, living with their own, being able to communicate and being understood, independence and living freely. Now they are dependant on us, its up to us if they have a good life. All you need to do is visit a dog shelter or rescue home to know that often that is not the case. Or day by day walk past them chained to a tyre with no respite from the blazing heat and their small patch of ground, as we had been. Our part of the deal quite often is not met. And as we sat in Mendoza bus station and I watched a little partially blind dog aimlessly wandering through the station, being attacked by a domestic dog in the process, I wondered if it was his semi-wild semi-dependent cohabitation with humans that left him feeling lost. Does the hunter-turned-scavenger, as he wanders the street or barks behind a gate, feel that something instinctive is missing. Like many domesticated animals, maybe all that’s missing is his wild home.